David “Avocado” Wolfe is the celebrity spokesperson for the kitchen appliance the NutriBullet and the co-founder of TheBestDayEver.com. He is well-known in the super foods and longevity universe and is the lead presenter for the Longevity Now Conference. He is also the author of the Longevity Now book. He talks to Jason on stem cell therapies that can repair the body, what bio dynamic food is, and how hormones affect our aging. [3:20] David Wolfe helped create the NutriBullet and Jason asks him which blender should he get. [6:45] Stem cells can help you recover in massive ways. David explains. [8:00] Why haven’t we heard more about these stem cell therapies? [14:10] Moving stem cells from one part of the body to the other? How safe is it? [16:05] Who can help us do these therapies? [20:40] How well we look greatly determines how well our cells can hold/retain water. [24:20] What’s bio dynamic food. [26:00] There is no such thing that one diet ca be good for everyone. [29:15] How do hormones affect our aging? [33:50] It’s an amazing time to be alive. We can go out and test ourselves and literally become the best version of ourselves. Hey, it’s my pleasure to welcome David Wolfe to the show. Other wise known as Avocado! Or David Avocado and he is the co-founder of thebestdayever.com. Founder and president of The Fruit Tree Planting Foundation, spokesperson and longevity and nutrition expert and the co-developer, I think, although I’ll let him speak to that of NutriBullet. That’s a product you’ve probably heard of. He’s host of Longevity Conference and author of Longevity Now: A Comprehensive Approach to Healthy Hormones, Detoxification, Super Immunity, Reversing Calcification, and Total Rejuvenation. Avo..What do I call you? Avocado? I mean, I don’t know what to call you, Avo? What’s your name? Thank you, I go by Avocado. So, all my friends call me Avocado and have for 20 years. So, when somebody says Dave, I don’t really catch it all the time. So, you can call me Avo or Avocado, that’s fine. Good stuff, good stuff. So, hey, you’re into a lot of cool stuff. You know. I love your name sake. I eat about two of those per day. I think they are a real super food and also they taste great. So, that’s good. Good stuff. Well, tell me, what are you working on mostly now? We’ve got a lot of areas to cover in the field of longevity sciences, but like what’s your main thing nowadays? I was into coaching and training and retreats and leading groups for the better part of 20 years and then what happened was I started a project with the magic bullet crew in Los Angeles to develop the NutriBullet blender so that has no become the main part of my life over the last five years and it’s just been an incredible success. I mean, it’s probably been the number one selling appliance in America at this point. We’ve sold millions of blenders and it’s just incredible, because we’ve gotten the power of this machine down to the point where what would normally cost $500 is now costing the $100 for the power and that incredible psychotic action. It creates like a miniature vortex in there, which completely emulsifies and breaks down all kinds of things that you normally don’t blend like kale, but with the NutriBullet, you can blast that stuff down and liquify kale and you’re not chewing through it. It completely goes in. Alright, listen, since I’ve got the man himself here on the show. I’m going to ask you some questions about that, because I don’t totally understand this. I used to have the cheaper version, the Magic Bullet, kind of the original version. I bought a NutriBullet for my massage therapist and friend for Christmas actually and, you know, I thought about buying an expensive juicer, a Vitamix, you know, the $500 different products out there. I used to have Jack LaLanne’s Juicer years ago and stuff. Is there a difference? And which NutriBullet do I have to buy? Do I have to get a pro900 or the regular NutriBullet that’s like $90 or the $130? They are still both inexpensive. You named it. It’s actually the pro900 is really a breakthrough, because we’re able to get a really significant amount of power, actually 900watts of power into that small little space and it’s a sealed system, so it creates a really intense vortex inside that system and what it allows you to do is be able to liquify things even like wheatgrass. I mean, that 900 blender will blast and completely liquify wheat grass, which for $100 – normally when I’m on TV, I’m selling them for between a $100-120 bucks. That’s incredible. I’ve seen..
Can you put the nut of the avocado in it? If you want to. Absolutely. Wow, because that’s really good for you, isn’t it? To actually eat the nut, right? Well, it’s become more and more popular, that’s for sure. Yeah, I heard a lot about it lately. You’re not saying it’s good to do that even though you are Mr. Avocado yourself. Yeah, I mean, it’s not going to hurt you to do it here and there, but there’s a pretty powerful enzyme inhibitors in the nut of the avocado, so it’s one of those things, if you did it here and there, it’s nutritious, but too much it’ll kind of overwhelm your body’s digestive capacity. Too much of a good thing is not good. Alright, good to know. Yeah, so the 900 is the one to get. So, how many watts – it’s wattage then, that’s what the 900 is all about, right? Yeah, so it’s going to have a tremendous tork, so what that means is it’s going to drive those blades at about 22,000 RPM and nothing can really escape, so that’s what I love about it. You can take your vegetables, which you’d normally would think there’s no way I’m throwing that in a smoothie and literally and just liquify them right in there with your fruits. I love for example kale and beets and when you blast them in a NutriBullet, when you blast them in a NutriBullet, it’s wonderful, because you can really get all of that nutrition power. The other one is a 600watt just for the comparison for the listeners, so that’s a 3rd more powerful. Yeah. That’s good. Okay. And the 900 is great, but – or the 600 is great. The 900 just that thing that happened over the last couple of years where you realized wow, we can actually, I think we’ve got really incredible machine there, like one that will last, you know, it’ll be like 40 years from now, that’s for sure. Yeah, cool. Good, good stuff. I want to talk first, you know, we’ll talk some nutrition stuff today and all that kind of stuff, but I want to talk about sort of the blending edge of science here for a moment if we could and I want to talk about cell health, cellular health, and obviously nutrition plays apart of this and stem cells and some of this more out there stuff that is – we are on the verge of. Well, we really already had big breakthroughs, but we’re on the verge of some more amazing breakthroughs. It’s an amazing time to be alive, isn’t it? We’re on the precipice of something very, very massive and very incredible. Basically what’s been discovered is that stem cells, which begin basically in your bone marrow are not only the types of cells that can become other types of tissue, like connective tissue, but they are also governor cells, so that means they govern areas of your body. So, if you’ve had a long standing dental injury, for example, you might have used up your stem cells in that area and if you’re not able to replenish due to age, you can tart having dental damage or your teeth start breaking down, for example. Once you replenish those stem cells, those kinds of problems like dental injuries will just self-repair and I’ve experienced that personally and it changed my life. I was in pain for about a year with a very old dental injury that got worse and worse over about 20 years and after a year in pain, my first stem cell treatment where they went into my bone marrow, extracted bone marrow juice from my hips and then it put that into my blood and it stopped that problem in five days and it has never come back. Wow, that is amazing. So, can we do this with everything. I mean, can we, you know, repair aching joints or you know, knee injuries or make our skin look ten years younger by doing this? I haven’t really heard about that becoming mainstream at all. The thing is these types of therapies, they have escaped from control, so if the certain interests that are out there that don’t want us to actually have the real tools, we are making this difficult maybe in America, but you can get these kinds of therapies done in Europe or in Mexico, so these are called cell-based longevity technologies and they’re not the whole picture, but man, are they an important part of the future and for example, with my mom, you mentioned joints. My mom, crippling arthritis, in a wheel chair. One treatment where they, again, go into your bone marrow, they extract your bone marrow juice and then put that into your blood, very simple, very basic. It got her out of a wheel chair in one treatment. Amazing. That’s incredible. I mean, you know, I want to say that these stories, they aren’t believable. I mean, if they really happened, why wouldn’t everybody know about this? I mean, this is like sort of like the conspiracy theories of oh, gosh, there’s anti-gravity technology and unlimited free energy out there, yet some how the oil companies are keeping it from us. I mean, how can you keep that kind of stuff secret nowadays? I think it’s – in this case, I don’t think it’s like, you know, the oil industry has a long history of knocking out the best and brightest in terms of competitors to their types of energy, but with stem cells technologies, it’s pretty new. I mean, it really is pretty new on the scene. It’s really only been 15 years that this has been going on and really only in a big way in the last five years, so it’s just coming out right now. It’s just kind of broken through. I guess the concern here would be that there are potential, you know, very dangerous side effects of this kind of stuff, for example, all the research in the telomeres or however you want to say it and pronounce it, the end of our genes and how this can be – these get shorter and they could be lengthen through supplementation with say TA65, which is a supplement I’m sure you’re familiar with. It’s rather expensive. You can buy it on Amazon. You know, there’s some concern that could cause cancer or help cancers grow. So, this playing around with stem cells is not exactly a free ride, is it? I mean, this stuff has to be used with caution, right? You have to have the right doctors and the right types of stem cells, so for example, you can section off stem cells from blood and concentrate them. You can concentrate stems cells from fat tissue. You can concentrate stem cells from dental tissue. You can concentrate from fetal umbilical cord tissue, but the most powerful for most of us, because we’re not at the umbilical stage, you know, we’re in our 40s or 50s or 60s is going to be from our bone marrow. So, you have to have the right doctors, the right insight, and the right types of technologies, so I’m very fortunate, a very close friend of mine is an amazing doctor and one of the main guy’s behind TA65 interestingly and coincidentally, he basically took me a side and said, you need to check this out and basically kind of forced me to get my first stem cell therapy, which again, is just my bone marrow juice injected in my blood, so they put a needle into your bone marrow, they extract juice out and they just put it in your blood. It’s painful, yeah. I had a local anesthetic, so you know, it wasn’t that painful for me, but if you didn’t have an anesthetic, it can be painful, but it’s do-able, totally do-able. Yeah, okay. Alright. So, tell us more about the potential side effects or did you kind of finish that? I mean, if it’s done right, it’s stem cells from your bone marrow, it’s not like stem cells from a goat or you know, whatever other stuff that’s going on out there, then to me it’s extremely safe, because it’s just your own tissue injected back in and basically as we age what’s been discovered there’s a problem with the way the stem cells migrate out of the bone marrow and into our blood. It’s an age related calcification problem. So, what we’re doing if you’re listening closely to what I’m saying, which we’re basically by passing that problem. We’re just going right into the bone marrow, getting the juice out, and putting it right into the blood, so we kind of bypass the calcification component of aging that could be inhibiting the absorption of stem cells from our own bone marrow. Okay, so what is calcification? Calcification is an age related condition that we know as heart disease, arthritis, many different types of cancers are associated with calcification or hardening of the tissue. Most joint problems are associated with calcification where you give a hardening of the tissue. Skin problems, psoriasis are associated with a calcification of the skin tissue. So, what’s happening is that we’re basically being turned into stone as we age, you know, depending on what the name of the disease and it does have in common, like what’s a stroke and a heart attack have in common, they’re both calcification conditions of one sort or anything, so I started looking at this years ago and decided to write a book on it, because it’s a fascinating study. Like, what is actually behind calcification, which is, again, you know, it’s masqueraded as many different names of diseases, but ultimately they all have one thing in common, which is we started getting turned into calcium and iron, by the way. So we start excreting these minerals into our body and can we prevent that? Can we delay that and the answer is yes we can and that has an anti-aging effect. If we’re taking cells, you know, our own tissue and using it in another part of our body, I get the idea of by passing something, you know, that doesn’t sound too harmful. We’re not injecting stem cells from a goat, for example, you know, it’s our own stuff, right, so it sounds like it should be safe, but even moving our own stuff around to different part of our body, you’re bypassing a system. A lot of times I think, you know, it’s got to be that way for a reason, you know, if we have intelligent design, you know, we’re circumventing it, right? Can that be without consequences? I don’t know, but I just want to bring that question out there. Yeah, I love that question and basically when people ask me that question, it’s basically, we have to look at what’s happened to our parents, our parents parents, and the people who came before us here on the planet. They did and they died in away that wasn’t comfortable most of the time, whether it was like my mom. She would, for sure, if my mom didn’t not have this treatment, she would be basically very difficult to deal, because she was in excruciating pain with arthritis every day all day long and now her pain is completely gone. Now, I don’t know about you, but I don’t want to be suffering and I definitely don’t want my parents suffering, so that to me was like a real wake up call to see what happened to her. It just snap me into like, wow, the solutions are here and now here’s the point I want to bring up and it’s a phrase and it’s a phrase that goes around the natural healing world, but I want to give it truth and validity and this is it, our cure is within us. Our cure is within us and I mean that in every metaphor of what that means and literally what that means. So, that meaning is in our bone marrow is our cure. Our body manufactures it. So, it’s a riddle to figure that out. What else is on the, you know, in the exciting future of longevity sciences and health sciences, you know, that we’re right on the precipice of? You know, you talked about the stem cells, that’s an amazing thing. I mean, I guess maybe before I ask you that question, I should be asking you, where does one go to take advantage of this or at least to explore it. You mentioned Europe and Mexico, but that’s too general. I mean, is there a specific website our listeners should go to? I mean, your website? If you have a certain post on that or something that maybe people can search and find that specific thing? Please feel free to give out those resources. Okay, cool. Well, the thing you want to search is autologous mesenchymal stem cells, so that’s kind of a mouthful, but it’ll come it, if you punch it up on a search engine, it’ll come it. Autologous mesenchymal stem cells and then just start doing research on that, because that’s the type of treatment that I’m talking about and then the actual organization that I work with, doesn’t have a website, it’s basically just a group of doctors that have gotten together and do these types of treatments, mostly for professional athletes or for like very famous people all over the world, but anybody can go there and anybody is welcome, so I can give you like the director of it. My friend Tony Delamaza. I can give you his phone number and anybody is welcome to call him if you want to. So, let me just get it up here on my phone here and Tony is a wonderful guy and he coordinated me down there and we’ve become very good friends now, because now I’ve taken my mom down there, my best friends. His number is (786) 298-6477. Okay, yeah, good stuff. That’s a great resource, thank you for sharing it. How do we know that if we’re going, I mean, listen, I would be hesitant to go for any kind of medical procedure in Mexico. I feel comfortable with Europe depending on the country in Europe, but you know, how do we know that these, you know, things are reputable. You know, Americans kind of love having the FDA seal approval on these things, but again, I can pick a lot of bones with the FDA, you know? They have a huge share of problems. I mean, the kinds of drugs that are FDA approve that cause people to commit suicide the SSRIs, I mean, watch the documentary RXNation, I think it’s called. A lot more on that or listen to some of the other shows I’ve done on the topic, but you know, they kind of think, look it, there’s a certain sort of validity to that and you know, I got to tell you, the regulators in Europe seem to care more about people than the regulators in the United States who seem to care more about money. I don’t know, it’s just an impression! I think you nailed it. I think that’s what’s going on with our regulatory agencies. They are controlled by the big money whereas..
Yeah, I mean, the lobbyists have just bought out the country whether it be in the financial services world on Wall Street, for sure. We know Wall Street is ripping off the public every chance they get and with the FDA, with Monsanto and the rest, I don’t know, it just seems like the EU is, they’re up for sale, I’m sure any political group is. But you’re right. They seem to be more humanistic and I agree with you and basically the reason why I work out of Mexico is the doctors, by the way, are both Mexican doctors and American doctors. So, it’s a whole group of doctors, very famous doctors in Mexico. Cardiologists in particular and it’s just, it’s just an alliance of forces where this group of Guadalajara and our other group down from Southern California, Orange County, actually, have gotten together and this has been about 15 years running to really innovate these stem cell technologies to the point where they are now, which is, you know, the best therapies, again, I want to mention are the bone marrow technologies, but you can also use blood, you can also use fat cells. You can also use dental tissue and even umbilical cord tissue if you have it. If you have your own. Didn’t save my umbilical cord. I just didn’t think I would need it at the time. I know. It’s a bummer. It’s like, when I think back, I’m like woo, that would be so nice to have now, because these stem cell technologies are indicating that if you have your umbilical cord, you’re in luck, because then you have your embryonic stem cells, which are – that’s the holy grail. It’s just so much here, it’s so fascinating. It really is. Take us to another area of longevity or health studies that you want to talk about. You know, just anything. One of the things, I’m going to have Dr. Howard Murad on the show soon and I just finished his book, you know, on water and cellular water and, I’m buying into his theory a lot that a large part of our health and longevity and how we look is determine by how efficient and healthy our cells are at holding and processing water. You know, that seems like a pretty logical thing to me. Do you believe in that? For sure. I agree with that. I think that’s kind of, it’s so commonsensical, right. Nature’s solution to pollution is dilution. Water is key and staying hydrating is key and what I’ve found over the years in that area, which is interesting to me is that basically the two most primary nutrients other than breathing, but to ingest is actually water and sea salt. So, you actually need, if you drink too much water, we’ve all done this, you can actually get dehydrated and if you eat too much salt, you can get dehydrated. So, you actually need the right isotonic balance of water and I always recommend sea salt in order to be hydrating so, I always recommend that people use a little bit of sea salt in their water in order to hydrate better. So, actually put in the water, because if you drink too much water, you wash the salt out and that’s bad, so that’s why you can become dehydrated. Say that statement again, the solution to pollution is hydration, is that what you said? Nature’s solution to pollution is dilution. Is dilution. Okay, yeah, right. Good stuff. So, the toxins won’t build up too much. Do you like the Himalayan pink salt? I like the Himalayan pink salt. I think that salt bed – well, first of all, that salt bed in Pakistan is a very interesting history, because the existence of it is above the Cambrian layer, I’m sorry, below the Cambrian layer. So, these salt beds are believed to be excretions of lifeforms. The ocean is salty because of life forms, but yet here’s a salt bed that sits underneath the explosion of life, which apparently occurred in the Cambrian era and this was never ever rectified in any science. So, basically what ended up happening is they basically said well, there’s some weird thing happened in that are and all of a sudden this salt bed was flipped underneath the Cambrian layer, when in actually that’s just kind of an excuse. It indicates – that salt bed indicates that life existed before the Cambrian explosion. Yeah, good stuff. So, the salt and the water. What about any other tips on cellular health? First of all, nutrition is very, very important overall, so definitely hydration and nutrition are very key. So, generally eating as little as possible, you know, make sure you get enough calories, make sure you get the right types of food, but you want to over eat. Over eating is a major cause of aging and then another key is, you gotta make sure that food is clean. So, I recommend foods that are free of chemicals, pesticides, herbicides, fungicides, and all the other different suicides that are out there. So, that means you gotta eat organic or better or better. I like to put that in there, because organic food is just kind of good enough, but it’s not quite the best ever. What’s the better? What’s the step above organic. Bio dynamic food. You know, Rudolf Steiner style bio dynamic grown food, home grown food, because it has your energy in it. Your love in it. I would definitely say local and wild foods. You’re taking some quantum physic new age element into that, yeah, okay. Yeah, because it’s really true. If you grow your own tomatoes, you can detect it, you could detect like wait, there is something that’s better. A store bought store tomato will never taste like a homegrown tomato and so that to me, that’s the love. Okay, but what’s bio dynamic? Explain that a little more to our listeners. In the 1920s, early 1920s, Rudolf Steiner was a very famous philosophy, developer of Waldorf Education. He basically enunciated a system of farming that allows the food to capture more energy. He would call it astral energies, they are energies that come from the heavens down upon the earth and more telluric energies that come from the inner earth and outward so that we have more complete and full nutrition. Now, today we call that more minerals, more nutrients. We have more clear names for it, but back then they didn’t have quite the vocabulary, so it’s basically a really cool strategy for marketing and creating more nutritious food. Okay, cool. I gotta ask you a question and hopefully you’ll be willing to answer this one, you know, even name names if you’re willing to. Tell us about any quackery that you see out there in this field. I mean, forever we have had snake oil salesmen, right? Are there any just really quack theories that you’ve come across? I’m sure there are or quack, you know, ideas that you want to share? Okay, cool. I think the biggest one.. I bet you never get a question like that. I like that question. It’s a really good question and I think the biggest quack question or biggest quack idea is that one diet fits all. I think anybody who is promoting a single diet is being the ideal diet for humankind is not really thinking about humankind. They are thinking about themselves, their immediate peer group. The human body, the human experience, you know, that – the overall differences between us are so vast that we can not say that. So, whenever somebody says one is good for all, I just immediately go, mm, that’s going to be trouble. So, we have to work with bio chemical individuality. I think one of the key things is looking at statistically what is a major appropriate food for major populations. For example, when it comes to soy bean. Soy bean for about 40% of the population is very strongly estrogenic. Too estrogenic to be a major food in the food supply for everybody. So, in terms of population studies. I’m going to bring us back to like the things that are more tried and tested for the large variety of the population like chia seed. Like chia seed is a very good food. Very, very rarely ever causes an allergic reaction or untoward reaction in anybody and you know, that’s where we’re kind of at in our understanding of diets. It’s more about statistics and trends rather than right and wrong. Yeah, okay, that’s good. That’s good. I’m glad you mentioned this whole estrogenic thing for a moment, because I wanted to ask you, I don’t know where I was reading that, maybe it was Murad’s book. I’m not sure, but when it comes to skin health and I think, by the way, there is a very legitimate psychosomatic side of longevity science and that is not just feeling good, not just eating right, but it’s sort of the which came first, the chicken or the egg, right, and no body really knows the answers to that. How you look determines how you feel, right. I think it was maybe Murad how the estrogen hormone is what actually makes your skin look younger. Is that true and then how do you balance that? Because I keep hearing commercials on the radio that every male should have higher testosterone and are those mutual exclusive? Can you have both high levels of both and would that be good? I don’t know. Thoughts on that. When I wrote my book Longevity Now, that was a big issue was coming to a level of total understanding as much as I could based on the science of hormones and their role and I spent years and years studying it and basically certain types of estrogens are good for the skin and are anti-aging. Estrial actually, which is a type of estrogen, really important, I would say, antibiotic hormone, meaning it makes your skin supple, keeps you younger, it’s very important for metabolism, but I would say the bigger one for longevity would be like in a male testosterone, in a women progesterone, although none of them ever stand alone. See, yeah, because like, testosterone gives you energy and makes you feel vital and obviously there’s sexual component to it too, but just for energy and muscle mass. That’s really good for you and then difference in aging, like, you know, the common belief that women don’t age as well. I’m wondering, how do the hormones play into this? They do play a major role. They are signaling agents, so they actually act epigenetically, which means they signal the cell membranes to do certain things and to react in certain ways. So, for example, let’s say we’ve had too much estradiol in our system or you know, a metabolite of estradiol in our system and let’s say we’re in our mid 60s, that’s not good, because that’s going to cause our immune system to become lazy and it causes our body to become lethargic. It signals those things to occur, but what can we do about it? Well, we change the ratio of that hormone to other hormones, so for example, I’m a big fan of progesterone and progesterone in cream in particular is a protective hormonal nutrient and that can actually displace or balance off – helps us to balance off a very heavy estrogen dominant situation, which is effecting us due to synthetic hormones or fake estrogens being in the environment, age related metabolites of estrogens like forms of estradiol that can be in our body and even food estrogens like soy, they can have estrogenic effects. We need to balance that off with the anabolic hormones like testosterone, progesterone, DHEA, vitamin D3, which is a hormone, thyroid hormone by the way is very anabolic, very protective. WE now see there’s too sides of the court. There’s troubling estrogens and cortisol on one side and then on the other side, we have DHEA, testosterone, progesterone, vitamin D3, thyroid hormone, and the latest group that I just mentioned, that second group, has to be actually more influential on our metabolism then the cortisol and the toxin estrogens in order for us to be healthy and live a long time. Yeah, so how do we know if we’re balanced and then you know, supplement to get the balance right. Certainty a typical blood test at your doctors is not going to do it. Are there any programs you recommend or, you know, there’s some great websites now that track this kind of stuff and a lot of this stuff is becoming really, I love quantified self-movement, by the way, but a lot of this stuff is becoming a real, you know, pretty easy do-it-yourself kind of project. Of course, you can go for executive help screenings and, you know, it’s going to cost you five grand and I did one of them once, but there are some websites now where you just pay a monthly fee and you can go to a whole series of lab or a full lobotomist come over to your house and take your blood and they track your whole situation, it’s pretty cool. It’s pretty cool. I think that’s a really strong direction that we’re heading in, which is being able to kind of self-identify what’s going on for your particular metabolism and in particular hormonally. So, for example, I like what ZRT Labs does ZRT Labs depending on what country you’re in and they do a capillary test, which means they send you a kit so you know, you order, it’s a couple hundred dollars. You order a kit, they send it to you, and then you poke your finger and it’s a capillary test and you do ten splotches and then you send it back to them and they’re going to give you the results of where your hormones are at, your DHEA, your free testosterone, your progesterone, your estradiol, all of them. Estrial, estrons, cortisol and then you’ll have a map, you’ll start going okay, here’s where I am today, then now I make the changes. So, for example, that’s what I’ve written books on is what do you do if you’re hormones look like X to get to Y, right..
ZRTLabs.com and then you can kind of road map it. Once you know where you’re at. It’s, I don’t really recommend guessing. It’s not really a good idea to guess, because you know, if you have a really toxin estrogen metabolite in your system and you don’t know about it, that can really be dangerous because these things have been correlated to reproductive cancers. There’s no question about that at this point. It’s really kind of democratizing health care a lot and preventive health care, which is the most exciting part where people can have these tools themselves! And they can, you know, keep track a lot of this self. You know, some companies are even gamifying the whole thing. I mean, what a cool era in which we live, huh? This is the positive side of everything. There’s so many different things we can focus on. A lot of it’s negative, but there’s way more positive that we can look into and I think you’re right on to it is that we’re on a complete breakthrough period in self-health care and preventive medicine that we’ve completely changed the landscape and it’s happening very rapidly, so we’ve got to be very careful about the doom and gloom report, which is not really the truth. Yeah, I agree. Technology is really enabling all of this and it’s an amazing time to be alive. It really is. Well, give out your website and tell people where they can find more. If you’ve got a Twitter that you want to give out as well, please do that. Okay, cool. I’m at DavidWolfe.com and all my social medias. The biggest social media where I’m having the most traction is Facebook, acutally. So, I’m David Avocado Wolfe on Facebook. Good stuff. Well, any closing thoughts you want to share before you go David? You know what’s amazing is that we live in a time where we have so many different roads to go down this path towards health and longevity, so what I really recommend is pick the lowest hanging fruit. Go after those things that you can get a handle on first, maybe it’s drinking more water, maybe it’s nutrition, maybe it’s these kind of stem cell therapies or just the things that make the most sense to you and there’s so many other different things for example making sure you get enough sun light, making sure that you live in a non-toxic environment,. Making sure you have a supported and loving relationships and then build it up from there. So, the way I really approach health is everybody is in endowed. I love that word, endowed, with their own unique path towards longevity and you just have to pick out what that is for you. Like, it’s really know thy self. Find out internally, like, okay, what is it that I can really do here that’s going to make a difference and then just put the petal to the metal. Yeah, good stuff. Excellent advice. 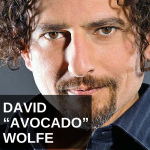 David Avocado Wolfe, thank you so much for joining us today.